We missed this last week, because we were distracted by the fog descending over League of Legends. But that particular mystery doesn’t seem to be dissipating anytime soon, so we should talk about the approval of two VOIP tools for one of the PC’s best free-to-play games – including one of the programs that first prompted Riot Games’ to clarify their third-party app policy in the Spring. 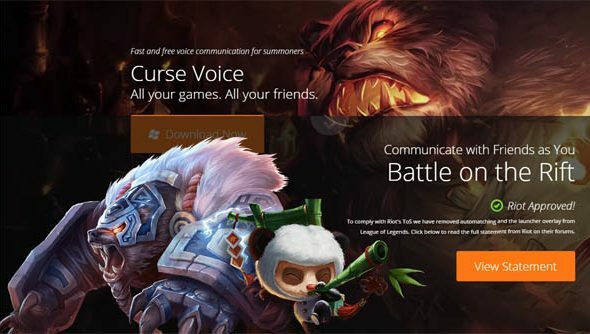 Curse Voice is a comms and chat app designed to overlay competitive games – and MOBAs in particular. The popularity of its early beta version forced Riot to remind players that use of the app and ones like it would be in breach of LoL’s Terms of Service. In short, any software which interferes with the player experience between the beginning and end of a match is a no-no. But it transpires that Riot have been working with the developers of “many” applications over the past few months, including Curse and Razer. As such, the latest versions of Curse Voice (6.1) and Razer Comms (2.1) have been officially approved for use in-game. “I should note, however, that with all third party apps these situations are subject to change as programs evolve, and this issue may be revisited in the future if the situation warrants it,” said developer relations manager Riot Sargonas. It’s important to note that neither Curse Voice nor Razer Comms are officially supported by Riot – so you’re on your own when it comes to performance, bugs and the like. Think you might install one of ‘em anyway?